Register using the Campus Recreation Online Services or stop by the Seahawk Adventures Office during open office hours. Registration for weekend clinics and workshops ends at the close of business for Seahawk Adventures on the Friday before the event. You can't truly go Teal until you've found yourself on a surf board riding waves on the Carolina Coast. Take advantage of one of the area's most amazing resources and learn the basics of surfing with Seahawk Adventures. Please Check Back in the Summer for more Surf Clinics!! Cost: Students: $22.00; Faculty/Staff: $27.00;Guest: $30.00 *Dates are tentative based on water temperature and conditions. Please email adventure@uncw.edu if you would like to know the current status of these clinics. The climbing is free, but sometimes the wait for a belayer can slow you down. Join the Seahawk Adventures staff and learn how to safely belay others down. Belay clinics are open to students, staff and faculty! 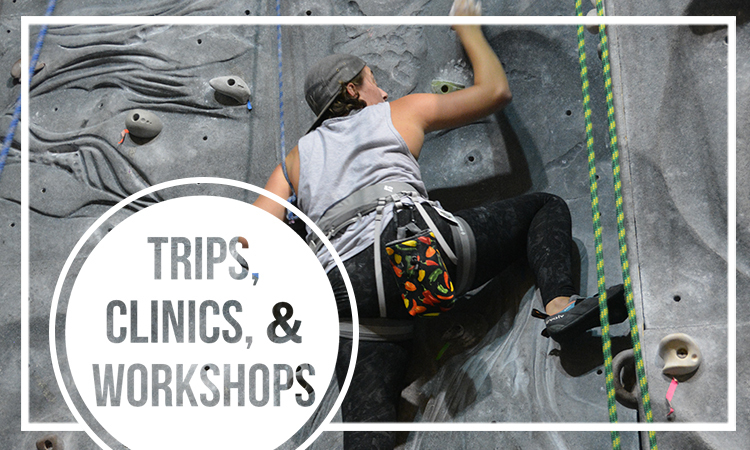 Contact us at adventure@uncw.edu or 910-962-4052 to inquire about scheduling a custom belay clinic! There is a maximum of 6 participants for each belay clinic. Interested in hosting a workshop on adventure skills? Call the Seahawk Adventures office at 910-962-4052 to schedule one! We customize our workshops around what you are looking to learn about.